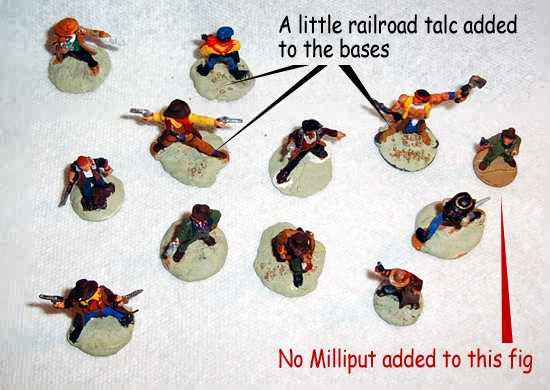 As promised, here are some quick photos to chronicle my first attempts at using Milliput epoxy to sculpt new bases for some of my Wild West miniatures. Milliput is a heavy-duty epoxy that is shipped in two, rolled cylinders; it is activated when mixed and will air harden in a few hours. I believe this is an industrial grade epoxy and it is probably a lot more durable that I need. But I had it on hand, so I decided to use it to try adding a little style to the bases. Yuck! What a mess. First of all, I started with WAAAAAY too much! About an inch of each color. I wound up throwing half of it away. I decided to use the standard gray/green Milliput. I read the directions and it suggested that I knead it with water on my hands to cut down on the adhesion. It got so tacky that I actually had to knead it under a small stream of tap water. It took a LONG time to get to a smooth consistency. I wound up crumbling it a bit and working the crumbs together. 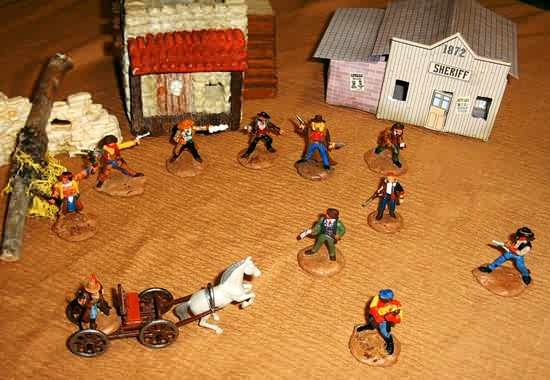 Then I had a big problem with getting it between the legs of the painted minis. I'm going to have to touch up some spots where it stuck to the mini and where, on unsealed minis, it lifted the paint off when it touched. I think next time I won't try to retro-fit this on the minis – I'll add it to the primer or perhaps even the bare metal prior to primering. It was very difficult to work the putty between the legs. It’s very sticky and can pull the paint off the figure. If it does stick, it’s better to just leave it and chip it off when dry, or just paint over it. Note the little dot of Milliput on the knee of the figure to the right. There is also a small dab on the bottom of the duster on the figure to the left. I got 11 bases done before calling it quits. I guess it only took about 40 minutes once I got the stuff kneaded and ready to work. Then I remembered that I wanted to work some talc into them. I had it all ready but was so focused on the sculpting that I forgot it. I did push some grains into some bases, just to give them a slightly different texture, but I don't think it will really matter. 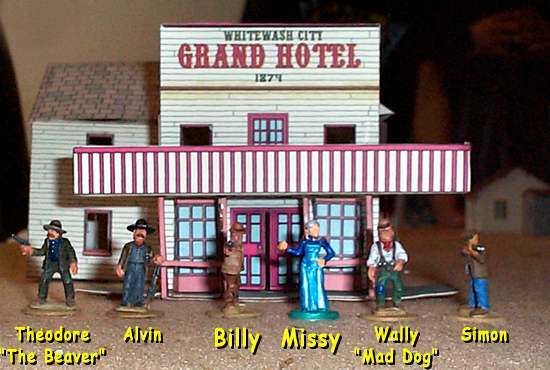 Once the epoxy was mixed, it took about 40 minutes to do 11 figures. I made a lot of bumbling errors (it’s my first time) and I know I’ll improve with experience. At the last minute I remembered to push some talc into some of the bases, just to give them a little texture. In this photo I included one figure with its original base, just to show the contrast between them. I strongly suspect one of the last bases I did is not really adhering to the mini with the birght yellow shirt – I suspect it'll fall off later after dries. We'll see. Also, note that two figures on the bottom row have "stripes" between their legs. 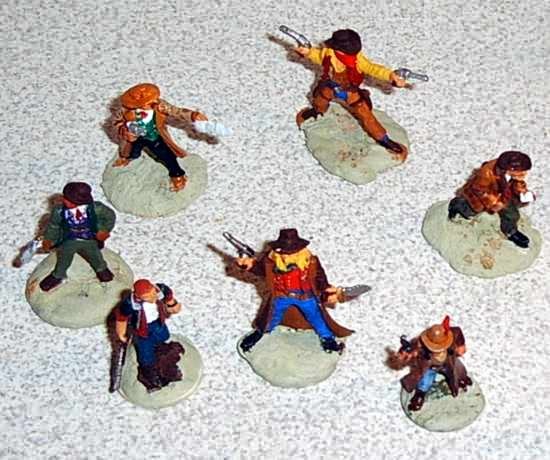 The man with a shotgun and the Indian bounty hunter (bottom left and right, respectively) were some of the later minis I based, and I found it easier to just work the epoxy up to fill the space between the washer and their own base. 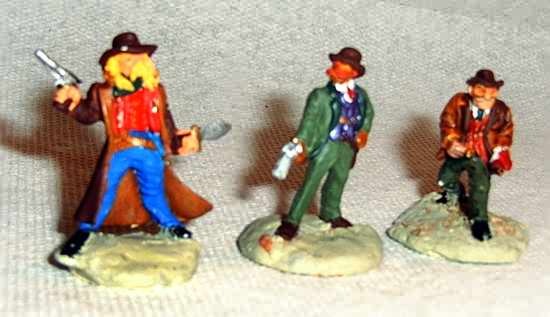 In short, I didn't try working the putty between their legs because I didn't want it to stick to their paint. After the Milliput hardened overnight, I came back to paint them. This was very easy (as you can see, I mostly did a flat coat that closely matched my game table drop cloth). I did add a light wash to bring out some details, though, and did a tiny amount of dry brushing on some of the talc. Speaking of the talc, it did not hold up very well - a lot of it flaked off. I'll experiment with glue and other sealants in the future. Yet, even where the small rocks flaked off, they left nice textured impressions, so it really didn’t bother me very much. Where the talc did stick, however, it looked fine. All the newly based figures gather for a group shot after a rough day of convention gaming. All in all, it was a bit of a hassle, but it turned out to be worth it. The extra weight improved the figures' stability, and they all looked a lot better on the table. More "finished," I think. I'll post some more close-ups soon, and I may experiment with some different epoxies or putties (perhaps something that is easier to mix). But I definitely like the way this looks and will be doing more of this in the future.